Cats need dietary taurine, but significant quantities naturally occur only in animal tissues. A shortage causes blindness and heart disease. Most mammals biosynthesize vitamin A from the yellow pigment (carotene) found in vegetables. Cats lack this ability, making a dietary source of this vitamin, found naturally only in animal tissues, essential. Vitamin D is another essential vitamin, found naturally only in animal tissues as D3. The essential fatty acid arachidonate is rare in non-animal sources. Cats require it for numerous vital metabolic processes including reproduction. 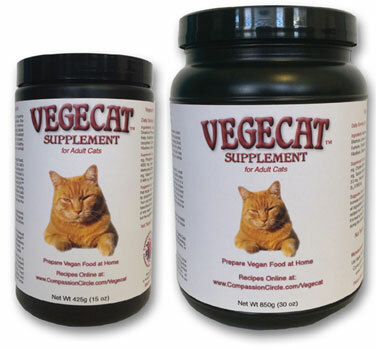 Vegecat products contain the rare nutrients mentioned above derived from non-animal sources, such as D2 from yeast. Recipes meet nutrient levels established by the Association of American Feed Control Official’s (AAFCO) Cat Food Nutrient Profile for adult cats, without using any animal products. Each container comes with simple recipes which, when used with Vegecat, are formulated to meet all the nutritional requirements for adult cats. (For kittens, see Vegekit also offered on our site.) Vegecat recipes may include ingredients such as lentils, garbanzos, tofu, TVP, & yeast (we highly recommend VegeYeast as it is the healthiest for cats). For detailed feeding information, download the Vegecat™ instructions here. Available in 2 sizes – Medium (15 oz. / 425g) container is $32.49 and will last a 10 lb. cat around 3 months, and Large (30 oz. / 850g) container is $57.99 and will last around 6 months.